Louay Kayyali was born in Aleppo on January 21st, 1934. 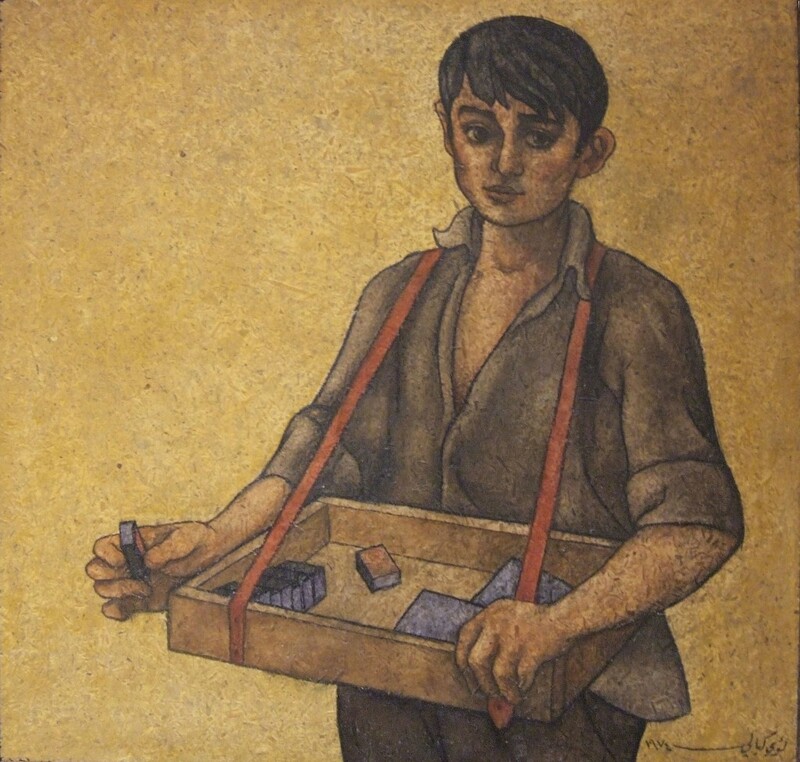 By the age of 11 he began to study painting, and at 18 he had his first exhibition at Al-Tajhis Al-Oula School. In 1956 Kayyali was granted a scholarship by the Ministry of Education to study painting at the Academy of Fine Arts in Rome. This was an incredible awakening for him, and he participated in a range of art fairs and contests, winning awards such as the Golden Medal for Foreigners in Ravenna. In 1959 he founded the first of a series of art fairs at La Fonta Nella Hall in Rome and went on to represent Syria with Fateh Moudarres at the Venice Biennale. In 1961 he graduated from the Department of Decoration of the Academy of Fine Arts in Rome and returned to Syria to teach art at state schools in Damascus. He eventually moved back to Rome to teach painting and decoration at the Higher Institute of Fine Arts in Rome, which was later known as the Faculty of Fine Arts. It was in 1966 that Kayyali developed symptoms of a psychological crisis. Driven by his desire to highlight social injustices, he began painting a series of charcoal works depicting torture and the struggle of man. In 1967 he made his 7th appearance at the Damascus Arab Cultural Centre with an exhibition entitled ‘For the Sake of Cause’, showing 30 of his politically charged works. This exhibition travelled throughout Syria and received very mixed reviews from critics, as well as a great deal of personal criticism from his fellow artists. Hurt by these negative comments, Kayyali later destroyed all the works from this exhibition and stopped painting. As a result he became increasingly isolated at his home in Damascus. In 1969 relatives accompanied him to Beirut for medical treatment by Syrian doctor Alaaeddin Al-Droubi, whom he was to continue to see periodically up until his death. Somewhat recovered, Kayyali returned to teach at the Faculty of Fine Arts in Damascus at the end of 1969, but when his father passed away in Aleppo 1970 his psychological health declined again. He continued to paint under the treatment of his doctor, and by 1971 was living on a monthly medical pension of 142.50 Syrian pounds. It was not until 1973 that he began to work again, and in 1974 organised an exhibition at the People’s Hall for Fine Arts in Damascus. Mamdouh Kashlan, President of the Association for Fine Arts wrote a book on his work during this time. He began to exhibit internationally, and his paintingFrom the Inspiration of Arwad was put in the collection of the National Museum of Damascus. A few months later he exhibited with Fateh Mudarres at the National Museum of Aleppo. This period was highly productive and successful for Kayyali and at his next solo exhibition, held at the People’s Hall of Fine Art’s in Damascus, he showed 42 paintings, all of which were sold before the exhibition’s opening. His work continued to be collected by the National Museum of Aleppo and he exhibited throughout Syria. In 1977 he immigrated to Italy, hoping that Rome would reignite the same enthusiasm for painting and life that he had experienced as a student. A year later, finding that Rome was unable to re-invigorate him, he returned to Aleppo. He lived in solitude and gradually became addicted to tranquilizers and other substances. On the evening of September 9th 1978 he passed away from burns sustained after his bed caught fire, allegedly from a cigarette and was buried the next day at Al Saliheen Cemetery in Aleppo.